In statistics, a two-way table is a table used to give information about the frequency of two variables. The rows of table are used to give information about one of the variable involved & the columns give information about the other. This data obtained from the two-way tables helps us to extract or obtain extra information which can help us to answer many related questions and analyse the given problem. The horizontal lines forming the table constitute the rows & the vertical lines are said to form the columns. Now, we consider one example. Let us consider the two- way table giving the information about the number of boys & girls of grade 7 students who play football & cricket. The rows give the frequency i.e. number of students’ gender wise whereas the columns give the frequency i.e. number of students as per the game played by them. If we take a look on the rows, we have total number of boys in the class as 60. Out of these, 35 play football & 25 play cricket. Total number of Girls in the class is 40, out of which 17 play football & 23 play cricket. If we take a look on the Columns, we have total number of students playing football in the class as 52. Out of these, 35 boys play football & 17 girls play football. Total number of students playing cricket in the class is 48. Out of these, 25 are boys & 23 are girls. Total number of students in the class can be obtained by finding the sum of total number of boys & total number of girls i.e. (60 + 40) = 100. The same can also be obtained by finding the sum of total number of students playing football & total number of students playing cricket i.e. (52+ 48) =100. 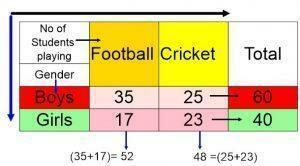 The number of students playing football is 52, which is more than the number of students playing cricket i.e. Hence, football is preferred over cricket. The number of boys playing football is 35 & number of boys playing cricket is 25. Hence boys prefer to play football. The number of girls playing football is 17 & number of girls playing cricket is 23. Hence Girls prefer to play cricket over football. From the above example, we see that the two-way table is a table, whose rows & columns give us information which can be used to answer many other indirect questions & analyse many other dependent things. Use the information given in two-way tables to answer the questions given below. An information regarding the number of persons in a group drinking tea, coffee & cold drinks is collected & presented in the form of a table. How many men are in the group? How many women are in the group? How many persons are there in the group? How many persons drink tea? How many persons drink coffee? How many persons drink cold drinks? Which is the most preferred drink: tea, coffee, cold drink? 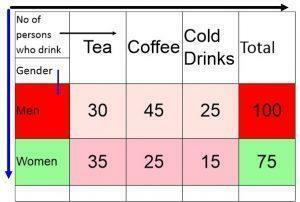 Which is the least preferred drink: tea, coffee, cold drink? What do most of the men prefer to drink? What do most of the women prefer to drink?